Hiya, Shannon! I’m so excited to have teamed up with you for the #MGGetsReal campaign—to highlight books with tough topics for “real” kids. I can’t express how important it is for people to be able to find themselves within the pages of a book, especially kids who can be so self-conscious during their pre-teen and teen years. And thanks for joining me for this Five in Five. I’m a huge fan of your books Ruby Lee & Me, as well as The Ballad of Jessie Pearl. What can I say? I’m a sucker for historical fiction and perfect execution of story. My readers and I are excited to learn more about you, so let’s get started. Quick and fun. Ready? I’ve always wanted to write a book—always, as far back as I can remember, but it wasn’t until I became a mom and started reading children’s books to my son that I seriously pursued publication. My favorite thing about being an author is the easy part. I love holding a published book in my hands and seeing my name on the cover. Writing a book is like creating magic out of thin air. Wonder by R.J. Palacio. That book just makes you want to be a better human being. Sara Pennypacker. I have a hunch she’s as much fun as her character, Clementine. I had a pony named Spot when I was growing up. I used to ride him all over my grandparents’ hundred-acre farm. Joyce Hostetter. I’d ask her how her book Blue evolved into a series. Great answers, and here’s to hoping Joyce will pop on over and answer your question. I’m sure many readers would love to know. 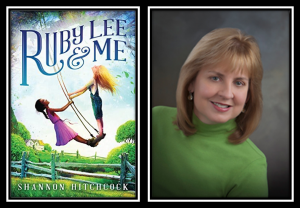 Thanks for being here, Shannon and congratulations on all the accolades for both novels!